This book will resonate with anyone whose high school years weren’t all yippy skippy and RA RA RA! Those of us that lived our awkward adolescence in anonymity, or wished we had because the attention wasn’t of the positive variety. Especially if you harbored a secret crush on a really cute football player (Not mentioning any names, Jason Wilson), who had no idea you were alive. Brynn was different in high school. She expressed her personality and love of art by dressing in period clothing (Dressing from another era, like high Victorian collars. People might consider it costume.). She had (has) a habit of reciting random quotes from plays and books in everyday conversation. There isn’t any mention of friends from high school or even college. She led a very lonely existence. Teased and humiliated in front of the school. The one time she was brave enough to approach the boy of her dreams, football player Sawyer Raines, he blew her off. Sawyer walked away without bothering to respond to the question. Brynn was devastated by his rejection. High school was nothing short of torture for a girl who didn’t fit in with anyone. During her sophomore year of college Brynn’s roommate gives her a makeover. Brynn still wears her vintage clothes, but she has a new style. She loves literature, theater, kissing figurines, and romance. After graduating college Brynn returned home to help run the family store. She indulges her creative passion by acting in community theater. While rehearsing for a performance of The Importance of Being Earnest she meets the new director, none other than her high school crush, Sawyer Raines. Sawyer left North Carolina for New York. He became a screenwriter. After his screenplay is made into an independent film he comes back home to help his Mom repair their lake house in preparation for sale. His aunt ropes him into directing a community theater production. Sawyer really isn’t interested in directing the play, but he is interested in the actress playing the lead. Brynn is sad that he doesn’t remember her at all from high school, and a bit pissed off. On the other hand she is glad. This is a chance to try her hand at being someone different. When Sawyer makes an assumption she listens to her brother’s well meaning, but off the mark, advice. Their relationship is temporary. Brynn thinks she can use this as a chance to practice her relationship skills. Sawyer wants a no strings relationship with an interesting girl. He has his own baggage when it comes to relationships. There in lies all the problems and the story line of this book. Brynn and Sawyer want each other. They enjoy spending time together. Feelings begin to develop. How can a relationship built on a lie grow? Neither wants to want the other one. They both do things to sabotage their relationship. Their story is very believable. It is well written and plays out realistically. There are some really sweet moments, that aren’t over the top. Brynn and Sawyer are very likable. 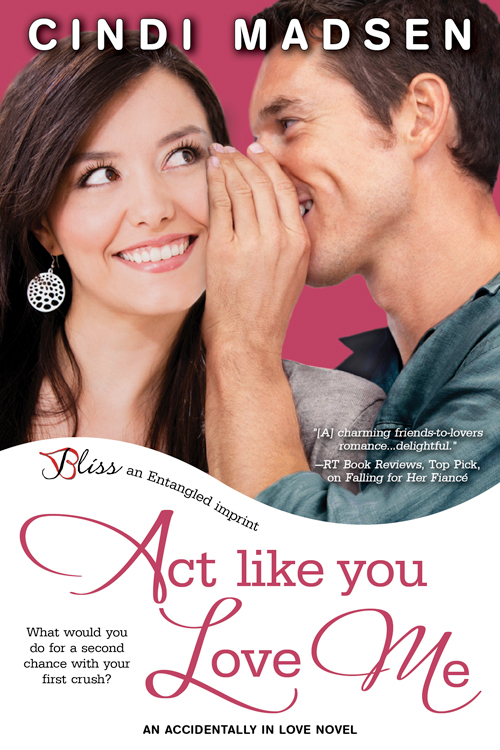 Act Like You Love Me is a very sweet story about a second chance love story. The book is part of a series, but it can be read as a stand alone story. I was provided an ARC copy for an honest review.